This new replacement engine is available for the direct replacement of older OMC Stringer, Cobra, MerCruiser and Volvo 1986 - 1992. This motor is a non-Vortec, Non-balance shaft design, but comes with a roller cam shaft ,w / Fuel Pump Pad and a 1 piece rear main seal. 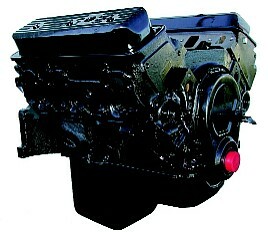 with one of the base engines shown.